- Most jewelry is simply meant to be beautiful. But the truly special pieces… the ones you return to time and again… are meaningful as well. 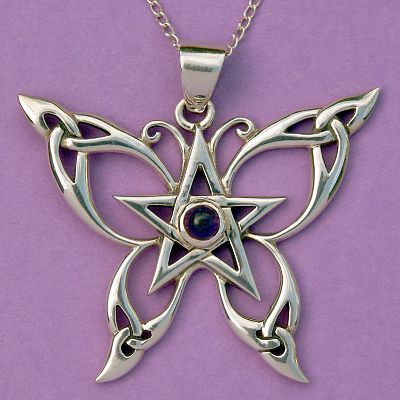 The graceful lines and delicate details of this Celtic butterfly pendant are quite lovely, no doubt about it. But it is the spiritual imagery found in this piece that really make it shine. 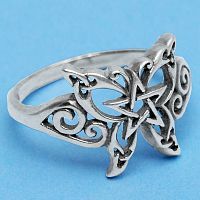 The butterfly is a nearly universal symbol of transformation. Don't we all feel a sort of kinship with the caterpillar, who trundles along from leaf to leaf hardly even lifting his head to observe the world around him, only to be reborn with wings, and the ability to soar in the sunshine? Which of us has not wished for a dark, protective cocoon to retreat to, in the hopes of emerging with new-found strengths and talents? 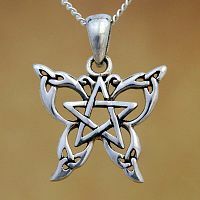 At the center of the Celtic Butterfly Pendant lies a pentacle, showing the spirit in balance with the four elements of earth, water, air, and fire. 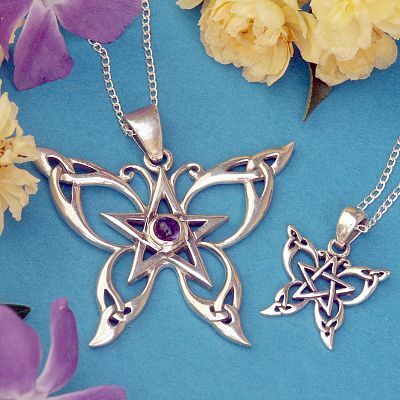 And nestled in the arms of this five-point star, at the very heart of the pendant, is a gleaming cabochon gemstone— your choice of either rainbow moonstone (intuition, feminine energies) or amethyst (temperance, restraint). 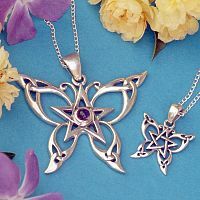 Choose Gemstone... Amethyst Moonstone Please choose the Gemstone. Please choose the Gemstone you want from the menu above. How large is this piece? 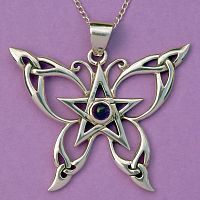 The Celtic Butterfly Pendant has a wingspan of 1 9/16" wide, and measures 1 1/4" tall. The chain that comes with it is 18" long. 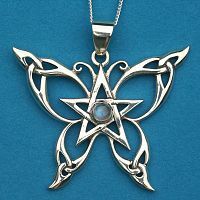 The Celtic Butterfly design was created by Paul Borda, one of the leading pagan artists in the world today. Paul begins his creative process with ritual, meditation, and visualization. Once he has a clear picture of the piece in his head, he moves on to carving in wood or stone. The final step in the process is handing off his finished piece to skilled jewelers who re-interpret the design on a smaller scale so that it can be worn and enjoyed. Paul pours hundreds of hours into a project like this, and a lifetime of experience, and it certainly shows in the final product, wouldn't you agree? 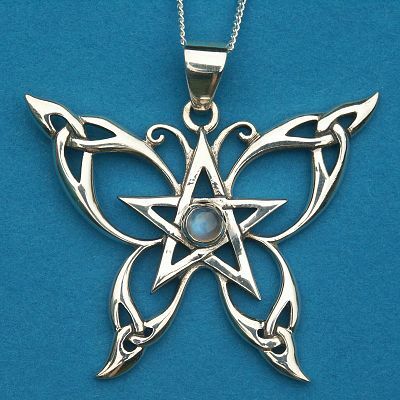 Celtic Butterfly design is © 2018 Dryad Design LTD.
Do you have any other questions about our Silver Celtic Butterfly Pendant? I have had this pendant for almost a year and love it. 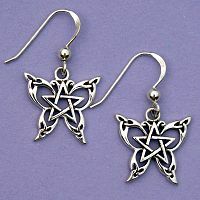 I also have have the ring & earrings. I get so many compliments on it. The picture does not do it justice. Beautiful piece, my girlfriend loves it. I love this necklace so much i got a tattoo of it! It fits perfectly, not small so it can be seen, it doesn't go off colour and the chain isn't short and it hangs a perfect length. The points on the sides do hurt but best to where it not on bare skin lol. Got it for my Mom as a Mother's Day gift. It's beautiful and will go with her wonderfully! A wonderful piece of work. Just be careful if you bend often and have it on a short chain. The points do hurt when they hit you. beautiful piece. i bought this for my girlfriend, and she wears it almost daily.